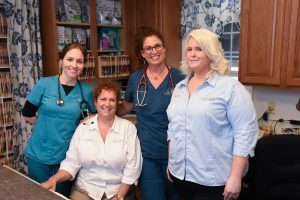 August 2018: Animal Hospital of West Chester had the pleasure of being one of the featured articles in the West Chester Liberty Township Lifestyle Magazine The theme for the magazine is Pets + Kids – and we were excited to be included in this edition. 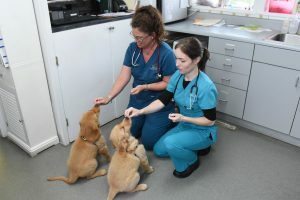 Read the article, 24 Hours at Animal Hospital of West Chester is a quick ‘typical day at a glance’ of what happens here at the hospital and provides just a peek into our staff’s busy workday lives. Thanks to everyone for the kind works to make this happen and for your ongoing love and support! Little Bit is our Princess!! She is the only little girl we have out of 4 poodles. We saved her over 10 years ago and we didn’t know her exact age. We know she is getting to be an old girl now and we were nervous to sedate her. She had 17 teeth pulled under anesthesia in this office! She did AWESOME! She woke up feeling great and ate a great deal right after surgery. She has already gained weight and seems to do well without the rotten teeth. We wanted the best for her and her health, so we are very pleased with how everything went. The best part about it all, her breath no longer smells bad! We get lots of kisses again. =) Our precious poodle princess is happy and healthy again! It’s the best! 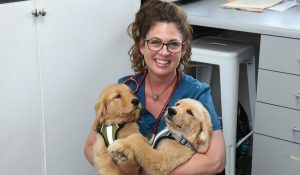 The Animal Hospital of West Chester is an operation with a brain and a heart. The staff cares in the sense your pet is special to them. The staff care in the sense that they are extremely knowledgeable when diagnosing your pet’s problems and treating them. They are well connected to other medical resources should specialties be needed. They are very professional, but, at the same time, they treat you like family. From the receptionists, to the techs, to the boarding staff and groomer, you will find that they really do care about your pet and, guess who else, . . . you! Thank you Dr. D for putting together such a great team and Animal Hospital. Our dog Meko (11 yr old Pekinese) suffers from intervertebral disc disease. Over the years his condition has gradually worsened. He was having difficulty walking and moving in general until Dr. Dehnbostel started using the therapy laser twice weekly for one month, then once weekly for a month, and now once monthly. He is much better and wants to run and play! Dr Dehnbostel, Dr Kara and staff, I wanted to take a minute to let you all know how much you are appreciated by not only Hamish & Rory, but by Alan and I also. Our dogs are a huge part of our family and as such we value the care, expertise and love that you show our pets. 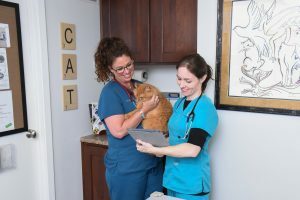 Whether it’s a regular check up or a visit due to sickness or injury we know that our pets will always receive the best care possible, and this gives us piece of mind. Thanks again! I want to thank you and all your staff for everything that you’ve done over the past 6 years or so in taking such good care of Captain Jack. I’ve never had another pet that so loved going to the vet and I know it’s because everyone is so friendly. Even though Jack left us too soon, I really appreciate everything that was done for him. I’m happy to continue our relationship with our new addition Murphy. I’m sure he’ll love everyone just as Jack did. Once again thank you for your support in taking such good care of our loving pets. Our family has been going to Dr D and AHWC for several years. When we brought our rescue Maggie to Dr D she had several medical issues at the time. Dr. D was able to treat Maggie’s issues and guide us in helping to give her a healthy life as she went into her senior years. When Maggie became seriously ill, Dr D was there to help us along the way to keep Maggie happy and comfortable in her final days. We cannot express how much we appreciate all your staff’s dedication. Thank you! Thank-you for everything! From the moment we walked into the office with our new puppy I knew this was going to be a perfect fit. The entire staff was very welcoming and caring. The practice and its level of care has exceeded our expectations. My puppy loves the day care you provide and looks forward to going, which I believe says a lot! One a final note, when he was ill the compassion that was given and the time spent reassuring me will never be forgotten. To the doctors and staff of the Animal Hospital of West Chester. Thank-you so very much for taking such great care of our little Timmy. I know you said he was a miracle dog, but that miracle would never have happened without your kindness, love and expertise. Timmy is doing fantastic! We cannot believe how well he is recovering! He promises to stop eating things he is not supposed to. Thank you for all the special care and concern you and your staff give to our dog, Sammy. Besides helping him with all of his allergy issues, we know you do such a great job of caring and helping us keep him healthy and comfortable through all the seasonal allergies that seem to plague him. Thanks so much for all your care and kindness! 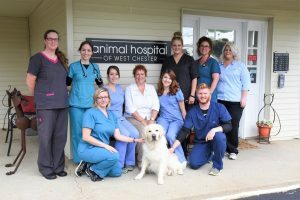 Words will never truly express the way I feel about the care and treatmentthat my animals and I have received at the Animal Hospital of West Chester.Dr. D and staff have cared for all my wonderful “fur people” (Bailey, Ethel,Lucy, Wilby and Tillie- as well as helping Butterscotch- an old friend’s catwho Dr. D. Did not even treat!) for close to 14 years.